No matter what kind of dental emergency you’re dealing with, Dr. Howard and his team are ready to help. Call our office immediately at 858-451-0550. Whoever answers the phone will be able to offer tips on how to handle your particular emergency and schedule a same-day appointment when necessary. You can call that same number after regular business hours, too, and our answering service will help you get in touch with Dr. Howard, your dentist in Rancho Bernardo. Read on to learn about what you should do in different dental emergency situations. Some dental emergencies are obvious while others are subtler. Not sure if yours is actually a dental emergency? Call us anyway. Rancho Bernardo dentist Dr. Howard would much rather see you and discover that nothing is the matter than miss a serious dental emergency. If you find yourself or a loved one facing one of these situations, you’re much better off coming to see Dr. Howard than going to your nearest hospital emergency room. The doctors and nurses there are not likely to have the training needed for a dental emergency. When should you go to a hospital ER? If your dental emergency causes excessive bleeding or is the result of a hard blow to the face or head that may involve a concussion or a broken facial bone, then get to the nearest emergency room. What Should I Do First for a Dental Emergency? As with a medical emergency, the first step is to stop the bleeding. Take a clean cloth or gauze pad and apply firm pressure. That should slow or stop the bleeding within 10 minutes. If not, then you do probably need to head for an emergency room. Do not take ibuprofen or aspirin for pain, because these are anti-coagulants that may increase bleeding. 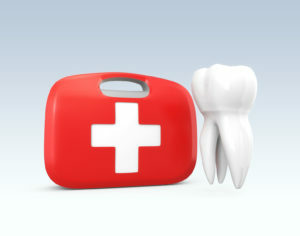 Next, if you have a knocked-out tooth or a broken tooth, handle both with great care. Touch only the crown, because there may be tissue still attached to the root. Rinse the tooth or fragment in water and then maintain the proper pH by storing it in the socket, under your tongue or in a sealed container filled with milk. Finally, never use force if you have a dislodged tooth. You can try to gently move the tooth back into position, but if that doesn’t work then stop! Too much force may loosen the tooth even more. Contact Our Office When You Have a Dental Emergency! Don’t hesitate to call our office if you think you may have a dental emergency. Dr. Howard and his staff are here to help any time, day or night.